Metamorphic Rocks. (Gk. Meta. = after; morphe = form). Hornfels; thermally metamorphosed Jersey Shale, Le Pulec. Metamorphic rocks are any sedimentary or igneous rocks which have been recrystallised by increased temperature (eg. contact or thermal during igneous intrusion), pressure (eg. dynamic, during folding and cleaving), combined temperature and pressure (eg. regional or dynamothermal during folding and intrusion) and chemically active fluids (eg. metasomatism). Burial metamorphism is also included where changes lead to high pressure but low temperatures (Allaby & Allaby, 1990, p. 343). It does not include diagenesis which occurs at temperatures and pressures existing at the earth's surface. The rock form is changed but not its overall chemical composition. New minerals form during recrystallisation and permit a subdivision into zones of increasing metamorphism based on two methods. 1. Metamorphic Zones (Barrow, G.). These are zones or grades of metamorphism separated by isograds based on the appearance of index minerals, for example, chlorite (low grade), increasing with the appearance of biotite through garnet (medium) to kyanite and sillimanite (high) grades. These zones were established for pelitic rocks (metamorphosed shales and mudstones). 2. Metamorphic Facies (Eskola, P.E.). These are zones which have particular observable appearances called facies. They are based on mineral suites or assemblages which occur in different rocks but which have been subject to the same degree of metamorphism. By this method, the minerals in each facies represent the original composition and any observable changes area a result of the particular degree and type of metamorphism. These facies were established for basic igneous rocks. In Jersey, the volcanic and sedimentary rocks have been metamorphosed both thermally and regionally and there are three places where gneiss occurs as wall stone. This rock type though, is not a local rock; and in one case it is known to be an imported rock. The shales, mudstones and sandstones of the Jersey Shale Formation have been metamorphosed by the intrusion of the Northwest and Southwest Igneous Complexes (predominantly, the granites). 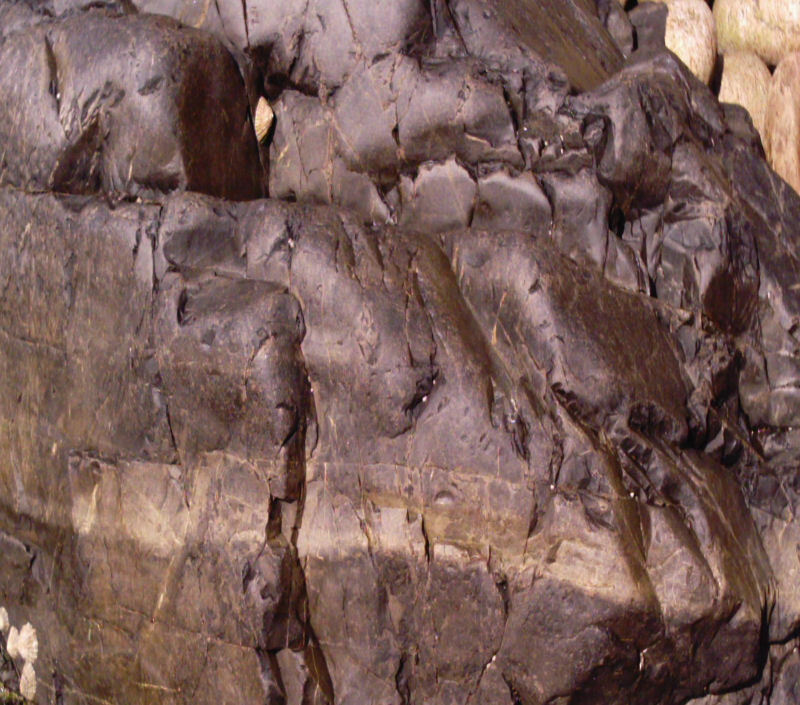 Around L'Étacq, in Le Pulec inlet and on the wave-cut platform, these rocks are spotted hornfelses, and are dark to light grey, compact and equicrystalline, with their bedding still preserved. 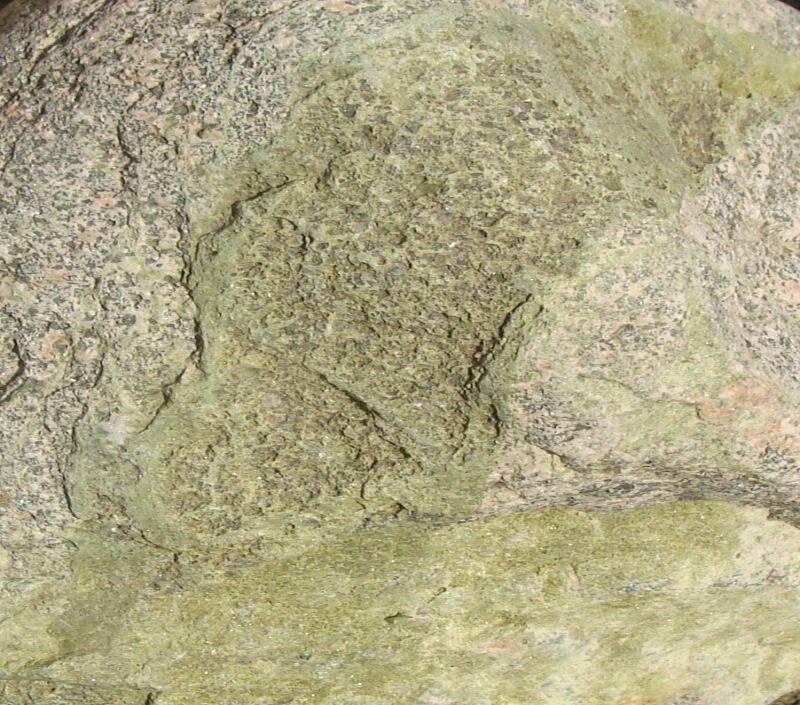 The spots comprise cordierite (an Mg Fe Al silicate) and biotite, while further south in St. Ouën's Bay and in Gorey, the greywackes have been thermally metamorphosed to hornblende-hornfels. The conglomerates along the northern edge of the formation contain chlorite spots in the matrix between the metasedimentary clasts and recrystallised biotite (Bishop & Bisson, 1989, p.8). In addition, the shales have been regionally metamorphosed to a low Green Schist Facies with the clay matrix having been converted to chlorite during subsequent folding. Chlorite is a green, platy, hydrous Mg Fe Al silicate and generally a product of alteration of Fe Mg rich (ferromagnesian) minerals. Elsewhere, the dykes in the Southeast Igneous Complex have been metamorphosed to a low Green Schist Facies characterised by an assemblage of chlorite, actinolite, albite, epidote and quartz (Allaby & Allaby, 1999, p.244). This is confirmed by Lees (1990, p.278) who adds prehnite and pumpellyite found in the basic igneous rocks which is another facies found in basic igneous rocks (Allaby & Allaby, loc. cit., p. 431). Lees states that this facies may be a result of hydrothermal alteration from the adjacent granite or of a local "regional event". Epidote in partly granitised diorite, La Motte (Green Is.). For those who would find a review of the facies helpful, the Green Schist Facies has the following minerals (summarized from Allaby & Allaby, 1990) which give it its appearance. Chlorite: a soft, green, mica-like (platy), hydrous Mg Fe Al silicate, from alteration of Mg Fe silicates (mafics) in basic rocks. Actinolite: a hard, light-dark green, prismatic (parallel-sided), acicular (needle-like) or fibrous or radiating (which gives it its name), hydrous Ca (Mg Fe) silicate. Epidote: a hard, green, yellow to black, rod-like to radial, fibrous, hydrous Ca (Al Fe) silicate, from alteration of basic rocks. Prehnite (after Col. H. von Prehn): a hard (6.5), white-green, platy, tabular/granular, hydrous Ca Al aluminosilicate, as cavity infill. Pumpellyite (after Rafael Pumpelly, US geologist): a hard (6), green to blue-green, complex hydrous Ca Al (Mg Fe Al) silicate. The above minerals being generally green, give the green colour to the Jersey igneous and metamorphic rocks, and being hydrous are said to be produced by hydrothermal alteration (for example, epidote), regional or burial metamorphism (medium pressure, low temperature) during the folding and intrusion of the island rocks. They occur with other main igneous and metamorphic minerals eg. quartz (SiO2) and feldspar (albite- Na Al Si 3O8). Believe it or not, rock has been imported to Jersey for use as building masonry, flag and edging stone, sills and stair treads, for example, Chausey and Cornish granites, Portland Limestone and limestone from the Bayeux Caen area in Normandy. Gneiss however, is one the more unusual rock types and two varieties are found; a mainly black biotite and white/pink/orange/light brown, feldspar banded gneiss (Brazilian gneiss) which has been used as a wall stone in the central St. Aubin's Bay area of the island, and a light yellow, muscovite, foliated granodiorite (Écréhous gneiss) which has been used to build walls and houses, found mainly in the north east in St. Martin. The biotite gneiss is to be found in the road wall east of the junction of La Rue du Galet and Victoria Avenue (Figs.1 & 2) where it appears as mainly of black and light brown or pink/orange banded blocks. Only four black and white distinctly banded blocks were found and these contained scattered, small pink garnets. This wall is a boundary wall to Seafield House and Seafield Lodge, and blocks of gneiss also form the eastern boundary wall of the Lodge and the House as far as NE corner and the right (in part) and left hand walls of the Seafield Coach House entrance on La Route de St. Aubin (Inner Road). Here, the best view is the outside elevation of the NE corner alongside the driveway into No. 32 on the Inner Road. Here too, there is more black and white, biotite and feldspar banded masonry as well as more black and light brown or pink/orange feldspar banded stone. It is noticeable that only the black and white banded blocks contain variable concentrations of small red/pink garnets. Smaller pieces of gneiss also form edging stones (one with a red garnet) to the garden paths (R. Miles pers. comm. ); here, the feldspar is also white to pink and light brown in colour. 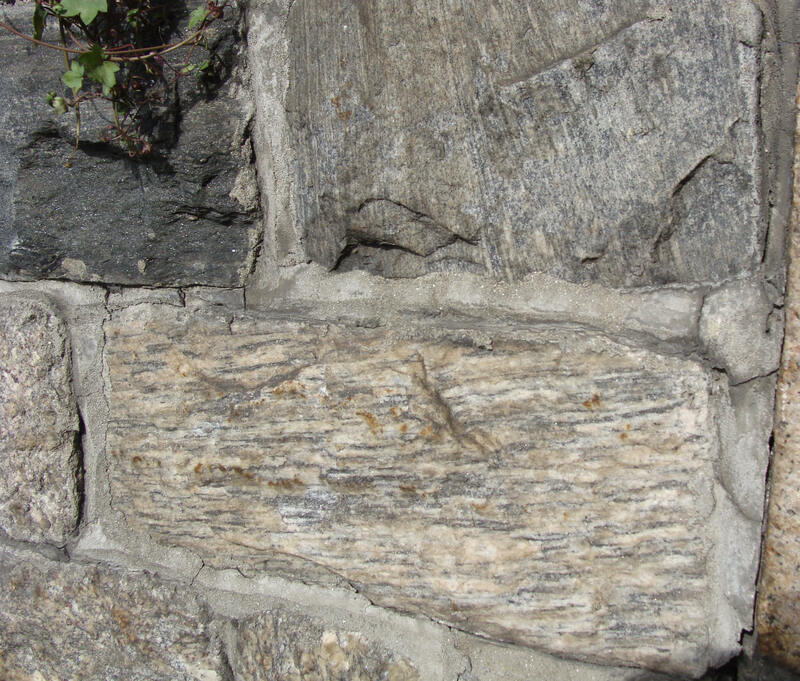 Similar gneiss also occurs in the western corner wall at the bottom of Le Mont Félard (Figs. 3 & 4) and shows the typical banded structure of dark biotite but the feldspar is often a pale brown to white and rarely pink. Recently, the wall to the east of the junction of La Rue du Galet and Victoria Avenue was rebuilt with the stone coming from within the Seafield House grounds immediately to the north (pers. comm. P. de Souza, stone mason and confirmed by the owner). No original source has yet been found. However, in an example of how much we owe to Father Charles Noury, it was found that he recorded the occurrence of gneiss 125 years ago in 1886, when he wrote about a fine gneiss arriving in Jersey at St. Helier where a ballast of twelve to fifteen tonnes of very fine gneiss from Brazil was discharged and subsequently transported and used for building around Le Petit Ménage, near the bottom of Fountain Lane in the Vingtaine of La Petite Longueville (see following). After his comments on previous studies of Jersey geology and in particular granites, gneisses and mica schists, Father Noury added a footnote (Noury, 1886, pp. 4-7). Dans le courant du mois de mai 1885 un navire venant du Brézil a déchargé au quai de St. Hélier un lest de très beau gneiss. On en a transporté de douze à quinze tonnes aux environs du Petit-Ménage dans la Vingtaine de Petite-Longueville. Il a en général le grain fin et les stratesbien régulières; parfois cependant on y trouve empilées de larges plaques de mica brun-marron, distribuées irregulièrement dans une masse granuleuse de feldspath et de quartz, ou bien encore implantées dans de beaux cristaux de feldspath rose-chair. On vient de seserver de cette roche pour réparer quelques murs de clôture auprès de Gros Puits. 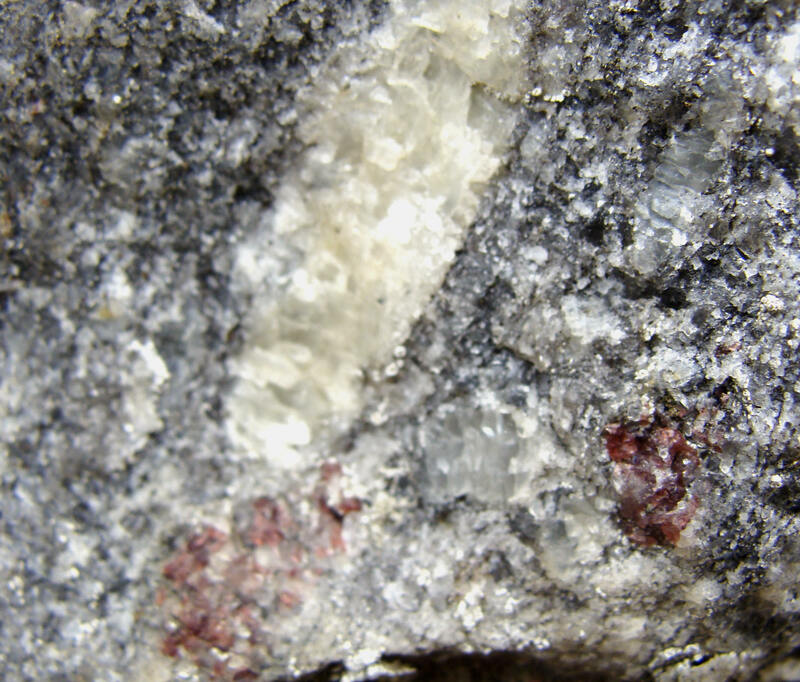 Noury describes the banded structure of alternating large mica flakes of shades of brown, and more granular white feldspar and quartz, but there is no mention of this gneiss being used in the St Aubin's Bay area. A visit to Le Petit Ménage revealed a more black and white variety which had been used to rebuild part of the wall adjacent to the entrance of Le Petit Ménage near the bottom of Fountain Lane, St. Saviour. Black and white banded stone used in both the outer and inner elevations contain several pink/red, almost granular crystals, which may be rubies(!) (or garnets) (Figs. 5 & 6). During later discussions with Dr Hill, a colleague and gemmologist in the Geology Section of La Société Jersiaise, he mentioned notes on the Victoria Avenue/Seafield House gneiss by E. Sumner (to be published) which she thought had come from ballast jettisoned by ship(s) from Brazil and that he had seen the site down Fountain Lane with garnets..not rubies! Subsequently, during a follow-up visit with him, the garnets were identified and we also found examples of the black and brown banded stone, some with rare small 'books' of biotite, in a collapsed section behind a brown lath fence. Blocks of similar gneiss, some with garnets then occur in the continuation of the wall towards the southern end of Fountain Lane; but in Le Gros Puits site (mentioned by Noury), just NE of Le Petit Ménage, we found none. The old farm has been demolished (R. Le Marquand, pers. comm.) and no gneiss seems to have been used in a redevelopment. 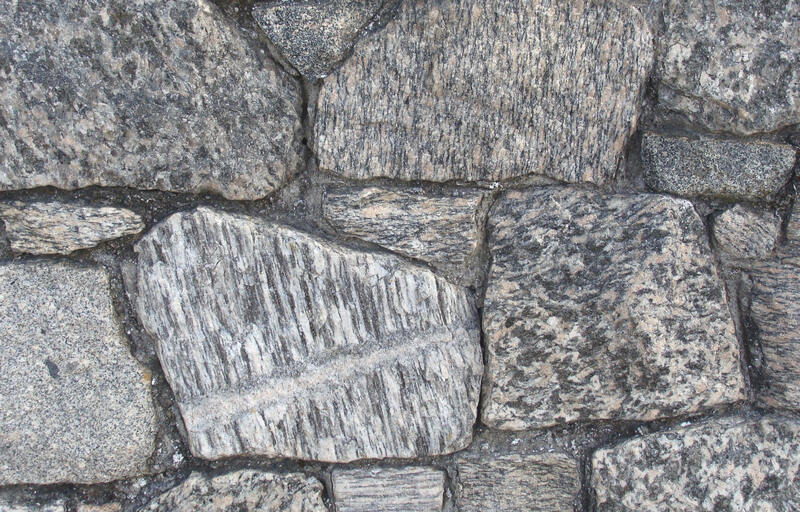 Similar blocks of gneiss have also been used in the road wall around the Langford Sports Centre at Victoria College, Le Mont Millais, St. Helier. 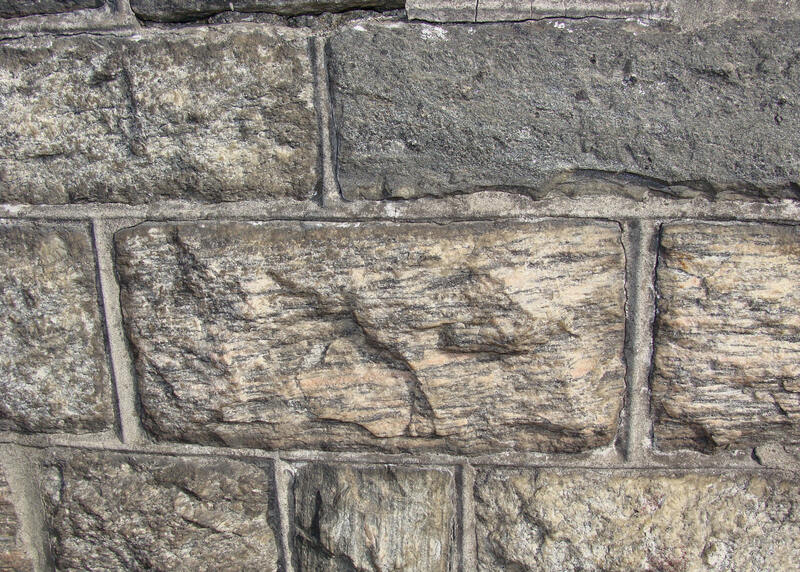 Here a dark band of stone along the centre of the wall, both inside and out, contains a few blocks of similar gneiss, with one foliated variety (Fig. 7). More blocks in the inner elevation are black and white banded and contain several red garnet crystals (Fig. 8). 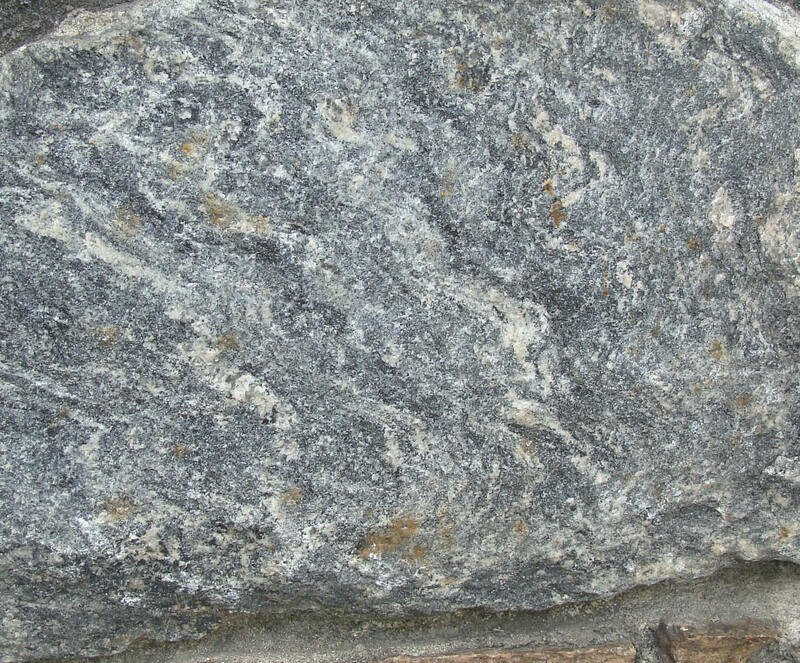 This gneiss is similar to that in the wall at Le Petit Ménage in Fountain Lane. The gneiss at Le Petit Ménage and Victoria College seems to be part of the ballast of Brazilian gneiss recorded by Noury (op.cit.) but only add up to about 700 blocks. Assuming an average block weight of 10 kg (based on the weight of a range of similar blocks) about 1200 - 1500 blocks would have been discharged in the tonnage mentioned. The number of blocks in the collapsed section could add up to the difference with the recorded amount. However, the walls around the Seafield properties are extensive and the six sections between brick columns on Victoria Avenue alone contain 1500 blocks. They consist mainly of black and pale brown, banded biotite and feldspar, as well as some pink-banded varieties and minor black and white banded types with garnets both on the Avenue and more numerously at the NE corner. Then there are the many blocks in the remaining lower walls. Some of the 'alien' rocks found on JerseyÂ’s beaches are thought to have been from ballast possibly jettisoned from visiting ships, but although the origin of the Seafield House/Victoria Avenue gneiss is not supported by a reference at present, there are too many blocks for it to have come from the Le Petit Ménage ballast even with several red garnetiferous blocks. 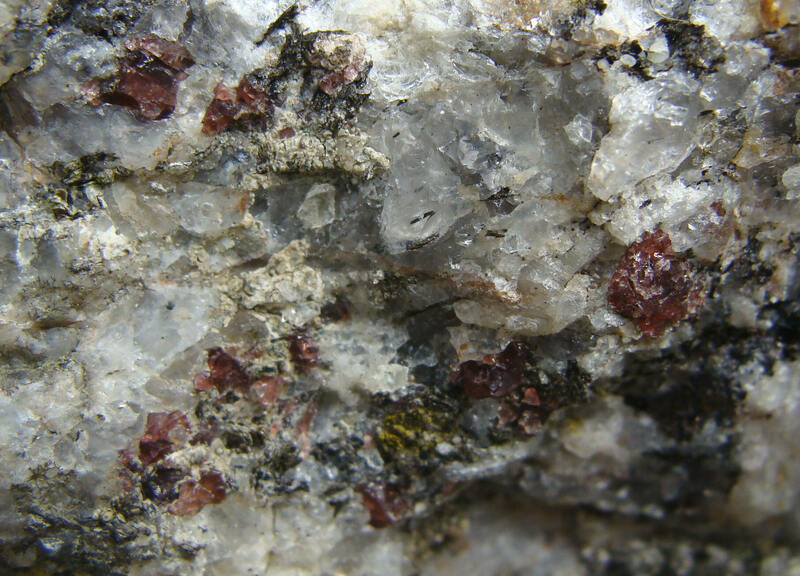 The abundance of the other coloured varieties, the much greater number and the garnet bearing types suggest derivation from other loads but from a similar Brazilian source. Father Charles Noury's detailed descriptions and interpretations of the rocks of Les Écréhous, Les Dirouilles and Les Pierres de Lecq (Pater Nosters), totally different from any in Jersey, were published in 1892. Possibly, they may lie on the shelves of libraries where his work, written in French, might not see the light of day. The following notes are the second example of Le Père Noury being the Â‘first of a kindÂ’ who accurately recorded the textures, structures and possible origins of Jersey's striking local and exotic rocks. His work also created the impetus to follow in his footsteps again, to try and bring his work to life pictorially, and to maybe add any other observations. The gneiss, described below, is another one he noticed after the one from Brazil described above (Noury, 1886, p.6 - 7). This second one comes from Les Écréhous, some three miles to the north east of Jersey, and in outcrop, consists of a pink, foliated muscovite gneiss which is the bedrock of various small islands and reefs which form the group. Some of these are connected by strand lines which contain rounded gneissic pebbles, often disc-shaped, along with pebbles of rock types found on Jersey. 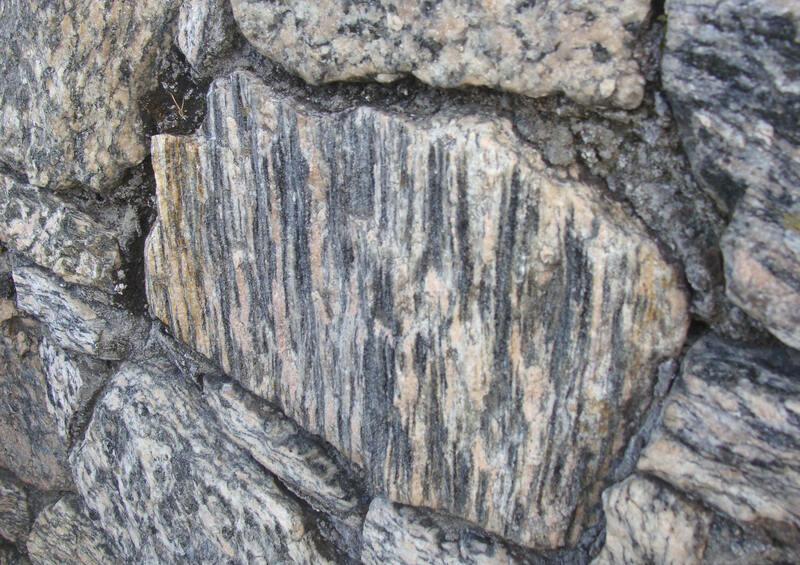 The gneiss stands out as markedly different from the widespread pink granite masonry in many of our island walls because it weathers to a pale yellow, with silver muscovite mica and parallel fractures which give it a foliated appearance. After his islands visit, Father Noury noticed that it has been used as building stone in some of the walls and houses in the north east of the island in the parish of St. Martin. The term 'granulitique' is an 'old and now abandoned term for a granite with muscovite and perfectly crystalline quartz, or a granite with two micas' (Foucault et Raoult, 2000, p. 163). Noury named it thus in contrast to a 'gneiss ordinaire' (Noury, 1892, p.9) because the quartz 'est moins étalé' - is less flattened or stretched out, 'ou plus granuleux' - or more granular. It is banded feldspar, mica and quartz with parallel lamellae of mica. It may also be called a 'gneiss rouge' but ours is pale. In recognition and respect of Father Noury's description of so long ago, and to those of the recent authors, another 'Jersey Geology Trail' was compiled to look for the specimens of this striking pale yellow, foliated gneiss which clearly stands out among the pink Jersey granite of the road walls and houses. Stop and wonder at how it was quarried, collected and shipped in from Les Écréhous so long ago, and how it was carried up the narrow lanes to the top of the plateau..... dragged on wagons?...by how many horses? In following Father Noury's footsteps by visiting Les Écréhous and walking around St. Martin, the present author spent much enjoyable time searching for and finding many examples of Noury's careful observations. For example, along the road from the south towards Rozel, the walls of the new cottages adjacent to the road at the Rozel Campsite have many blocks of Écréhous gneiss in gable and frontage (Fig. 3). Then along the road into Rozel and the harbour area there are several examples of the Écréhous gneiss in the road walls but more in the cottages further on. A walk down La Brecque du Sud and along the beach past the old Rozel (Le Couperon) Barracks reveals only a few examples, some partly covered with lichen, but in the cottages further along the beach, blocks of the stone (ashlars) have been used more abundantly (Fig.4). If one turns up the slipway and along La Brecque du Nord, there are excellent blocks in the house frontages, one on the right, the old Granite Corner restaurant, but more in the cottages on the left hand side (Figs.5 & 6). Then, back along the main road one can see more on the corner cottage before the turn up La Vallée de Rozel . Follow this with a quiet walk along the lanes on the higher parts of the plateau and much of what Father Noury observed is still there. 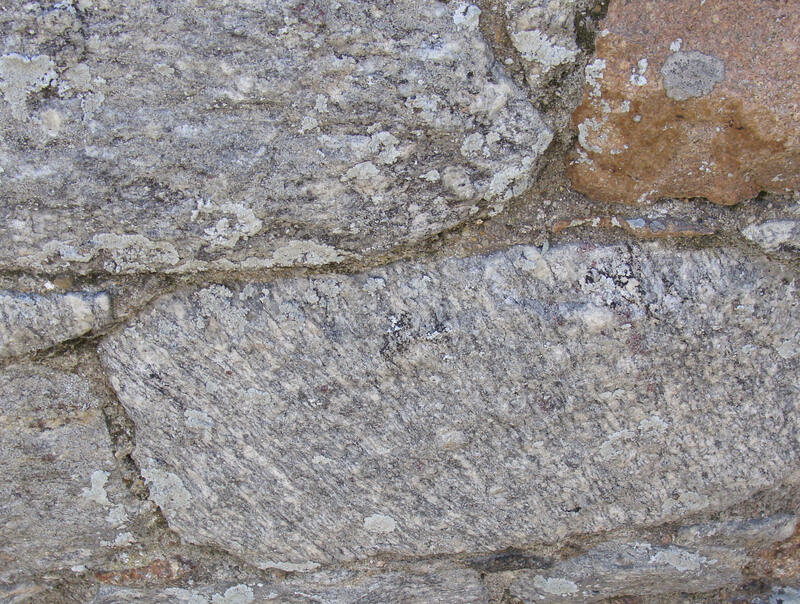 The gneiss can still be seen in the walls of houses, such as the front elevation of the house at the top of La Vallée de Rozel, appropriately named Haut de la Vallée and seemingly the house referred to by Father Noury (Fig.7). It can also be seen in the road walls on the heights near the old Rozel Mill and along the western sides of La Rue du Moulin and La Rue de la Ville Brée (Fig.8). It was impossible to examine some paler examples high in the mill wall but it would be interesting to try and verify the rock type. A little further away to the east and south east, blocks of the gneiss have been used in the old house and outbuildings at Le Vouêt Farm and in the wall along La Rue de la Pallotterie, with excellent examples at Bonaguil (Figs. 9 & 10) and opposite at La Palloterie itself, both of which have been described in detail (see below). More recently, Renouf & Andrews (in Rodwell 1996, p.18 - 20) described the gneiss more accurately as a 'foliated granodiorite' but accepted it as a 'granitic gneiss' after giving a detailed history of the work and interpretations of earlier authors. The use of the gneiss is then comprehensively described in a very detailed study of its use around La Pallotterie and Le Vouest (Vouêt) (Renouf, op. cit. p. 201 - 205). From a gneiss granultique to an orthogneiss (a metamorphosed granite), to a 'foliated granodiorite' or 'granitic gneiss', the Écréhos gneiss is from a different geological area and from a different time, yet so close to Jersey's very different rocks and representing a period of metamorphism unseen in them. The use of the gneiss in pebble form is easily distinguished from its use as quarried stone by the rounded nature of the former and the blocky nature of the latter. Some of the Écréhous gneiss (foliated granodiorite) masonry used in Jersey came from beach pebbles many of which can still be found on the north eastern beaches today, but also from stone quarried on the islands, the old quarries, well illustrated by Dr. Renouf (op. cit. p.194 - 205), still being evident, eg. on La Maître Île. The stone was then brought in by boat, details of which are at present unknown. Foucault, A. and Raoult, J - F. 2000. Dictionaire de géologie. 5e Éd. Dunod. Paris. Lees. G. J. 1990. The geochemical character of late Cadomian extensional magmatism in Jersey, Channel Islands, p. 273 - 291 in The Cadomian Orogeny, Geol. Soc. Spec. Publ. No. 51. (see D'Lemos et al. above). Mourant, A. E. 1933. Geology of the Écréhous, Pater Nosters and Minquiers. Ann. Bull. Soc. Jersiaise. Vol 12. 180-183. Mourant, A. E. 1956. 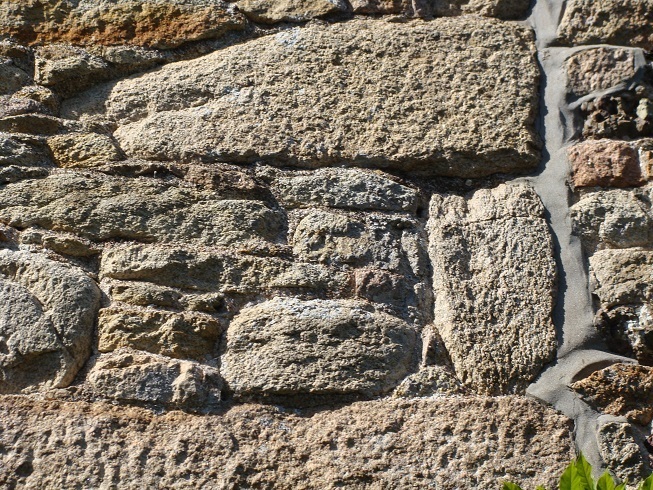 The use of Écréhous stone in Jersey. Ann. Bull. Soc. Jersiaise. Vol. 16 Pt. IV, pp. 373 - 376. Nichols, R. A. H. 2011. Jersey Geology Greats: In tribute to Le Père Noury. Ann. Bull. Soc. Jersiaise. 30. 3. p.393. Nichols, R. A. H. 2012. Jersey Geology Greats: In tribute to Le Père Noury. Ann. Bull. Soc. Jersiaise. 30. 4. p.572. Noury, Ch. 1886. Géologie de Jersey. Paris: F. Savy; Jersey: Le Feuvre., pp. 6 - 7 footnote. Noury, Ch. 1892. Roches des Écréhou, des Dirouilles et des Pierres de Lecq ou Pater-Noster. Description et Géologie. Ann. Bull. Soc. Jersiaise. Vol III, pp. 77 - 88. Renouf, J. T. and Andrews, M. J. 1996. Geology, in Les Écréhous, Rodwell, W. Société Jersiaise. pp. 17 - 36. Stevens, J. 1977. Old Jersey Houses. Vol II. Phillimore & Co. Ltd. London. p.193.